The 1950’s saw great changes in the music industry–changes for which the industry was not really prepared. And there were changes in the cartoon industry, too–and that industry was not necessarily prepared, either. 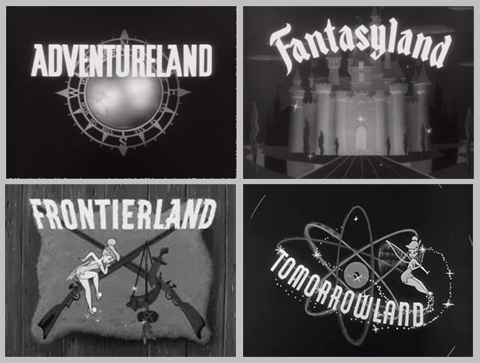 At Walt Disney’s studio, the one-reel short cartoon was providing less and less of the revenue, and so was of less and less importance. Even more notable was the fact that the theatrical feature-length cartoon was also meaning less and less to the Studio. Live-action films were providing more of Disney’s revenue than the animated features. And, on top of that, there was television. The winter of 1954-55 saw the veracity of these observations. Twenty Thousand Leagues Under The Sea was a big-budget feature, with big-name stars (including Kirk Douglas and James Mason), plus “breath-taking CinemaScope”: and “glorious Technicolor” (if not the “Stereophonic Sound” that Cole Porter would speak of in a song of a couple of years later). Following Disney’s usual practice, there had to be a song. “A Whale of a Tale” was given to Kirk Douglas, who was not known as a singer. At least he could carry a tune. 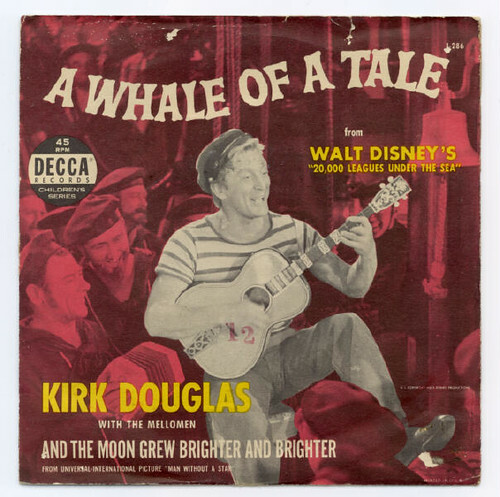 Kirk recorded this song for Decca. And it was covered by “Tex” Ritter (of all people!) on Capitol. Interestingly enough, both versions had vocal backing by the Mello-Men–who got credit on both labels. Within a couple of months of the December, 1954 release of these discs, there was an event that enriched Disney’s coffers to a considerable degree–and became a national earache for much of 1955. Disneyland (the TV show) had premiered on ABC in the fall of 1954, and was carving out a significant part of the Wednesday-night audience for the American Broadcasting Company. And when the first episode of a “Dave Crockett’ mini-series premiered–well that set the cat among the chickens for sure! “The Ballad of Dave Crockett” emerged in February,1955–and, within two months, eight or nine different records were on he market, covering the cantata of the coonskin cap. Below, the same song by The MelloMen, Fess Parker, Bill Hayes and Tennessee Ernie Ford. The die was cast. . . and cartoons would seldom contribute hit singles to the charts in the years to come. 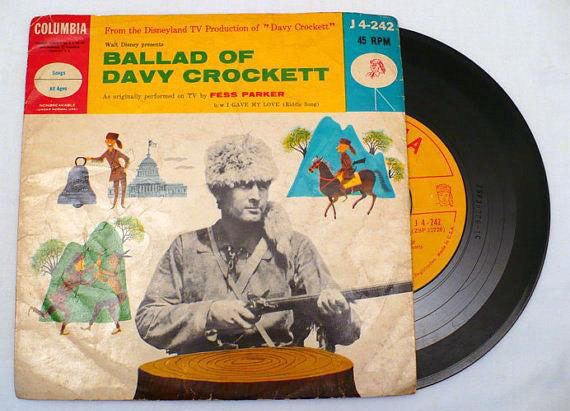 Fess Parker recorded an earlier acoustic guitar version of “The Ballad of Davy Crockett” in the 50’s, which is sung at a more leisurely pace and includes all of the verses. And not only the 1950s craze for him, bvut Davey Crockett continued to be a rather popular item on Disney records..I was bor in 1960, and I grew up wiht it, of course 1955 was the inital time, and hardly a long time before my birth. Even today Disneyland features the song, and certainly did the damndest – I mean, darndest – this IS Disney, well classic pre-PG Disney, anyhow – to promote it..plus Fess Parke,r in 1964, would up in the younger Aaron Spelling’s DANIEL BOONE, a LONGTIME hit TV show..! And the Kirk Douglas film gave us for the first time, THE SHERMAN BROTHERS!!!! Ah but music outside of the Disney stamp did give us all pleasure, even if their theme songs were not hits. Even a group as unlikely as the New York Dolls covered the COURAGEOUS CAT theme song, as you once pointed out in this column. The cartoons, themselves, were part of our lives in some sense, because the golden age was finding itself on TV every day. To this day, though, I often think that theaters abandoning cartoons and the history thereof was a bad idea. It is the scarcity of classic cartoons which leaves kids and adults unaware that animation actually has a history, and how ironic that Disney almost abandoned what put his name at the top of the list in the first place!! I hope we’ll be hearing about the other TV themes that followed. Swamp Fox, Elfago Braca and Scarecrow all had catchy theme songs, but did they get any covers? I remember most from when they were repeated on World of Color, a few years after their debut. Hayley Mills singing let’s get together from The Parent Trap I think went all the way up the charts to number one in San Francisco!